A world-class ensemble that calls the DMV home played under a renowned guest conductor on Monday night and filled the Music Center at Strathmore. The group played nothing but works composed after 1900 and ended the evening having earned a raucous standing ovation. Unless you read the title to this post, you’re probably saying “Wait—we have a world-class ensemble that plays Monday night concerts somehow?” But if you did read the title, you know that the group is “The President’s Own” United States Marine Band, which played under Gerard Schwarz, builder of the Seattle Symphony and tireless advocate for American music. He met his match on Monday. I am trying not to make any military-related puns in this review. 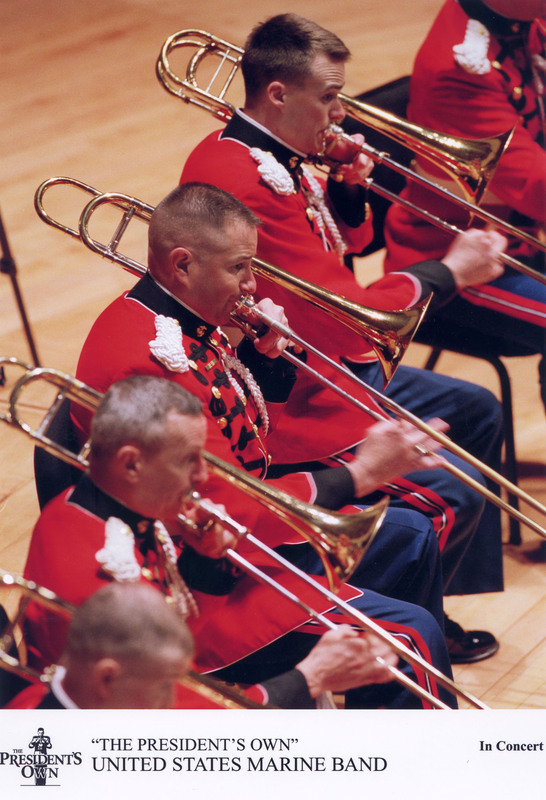 Photo from the Marine Band's website. For sheer quality of playing, “The President’s Own” ranks first among ensembles that call the DMV home. In sustained notes and chords, as in the opening section of Paul Creston’s “Celebration Overture” or the quotation of “Amazing Grace” in Aaron Copland’s “Emblems,” the massed woodwinds blend so well and make such an even sound that you could mistake them for a uniquely rich and seductive organ. Later in the Creston, oboist Master Sergeant Leslye Barrett took her solo melody with the utmost assurance, sustaining a smooth line while remaining expressive, traits shared by all of Monday’s soloists. The horns never put a foot astray in even the thorniest passages, like the spikier harmonies of “Emblems,” and the brass section matched what seemed to be dozens of distinct colors perfectly to each moment of music. Throughout the concert, the percussion came in right on point and with just as much volume as it needed to; when no percussion is playing, the musicians played in robust but flexible rhythm. And though they saved it for the biggest moments, the Marine Band can fill a hall with more sheer thrilling volume than anyone else. Can a band be as refined a pleasure as a top-flight symphony orchestra? When it’s this good, yes. At times, conductor Schwarz seemed like a kid in a candy store, picking from each section the specific delights he wanted at any given moment. This was never more true than in the work Schwarz composed for and premiered at this concert, “Above and Beyond.” It began with a trumpet fanfare that bore more than a passing resemblance to the one Copland wrote for the common man, but soon Schwarz called for a slower section that pulsed with wind color. Before the piece, Schwarz told us it described an unspecified journey (he went into excessive detail about all the different types of journey it could be), so obviously the calm mood had to become complicated by thornier music, and the initial fanfare that set off the work had to come back and remind everyone of the motivating impulse for said journey. So not the most original work in the world, but the melodies had a certain felicity, and Schwarz made canny use of the vast capabilities of the band. Marine Band concerts feature a lot of new-to-me repertoire, and Monday’s edition under Schwarz was no exception, as the audience got familiar with the “Ceremonial” of English composer Bernard Rands. This work sounds like Maurice Ravel’s “Bolero” in a funhouse mirror: both rely solely on repetition of similar-sounding main themes that are initially played by a solo wind instrument (bassoon for Rands) over insistent snare drum accompaniment, then developed with more and more elaborate orchestration. But Rands works in a predominantly minor mode, and between each iteration of his theme ambiguous harmonies tried to throw the monotheme machine out of whack. Rands also elaborates the rhythm as the theme repeats, making it more and more complex, giving the piece another source of internal momentum to fight and evolve against the interruptions. I found myself waiting impatiently to hear what would happen next. “Lincolnshire Posy,” by Rands’ countryman Percy Grainger, could hardly have been more different — the posy comprises six jaunty arrangements for band of Grainger’s own transcriptions of English folksongs. Here Schwarz led with lilting rhythms and the Marines followed merrily along, enjoying Grainger’s rich colors and occasional flagrant wrong-note interjections. It was a pure crowd-pleaser, unlike “Um Mitternacht” from Gustav Mahler’s Rückert-Lieder, which really was written for only winds and percussion and thus sat in the Marine Band’s wheelhouse. Mahler contrasts the ripeness of his melodies with strange snaps and slides in the accompaniment, and Staff Sergeant Sara Dell’Omo sang with a riveting purity and assurance, especially in the cathartic final stanza when sunlight seems finally to break out over the song. The only transcription on the program was a doozy: Frank M. Hudson’s resourceful rendering of “Medea’s Dance of Vengeance,” itself adapted by Samuel Barber from his ballet. With the flutes whooping Medea on to greater feats of vengeance and the brass crackling in fury, the orchestral strings were completely forgotten in favor of the icy hand of terror that seemed to be gripping the back of my neck. My only disappointment with this concert was that, while we did get the Marine Hymn as an encore, we did not get “The Stars and Stripes Forever,” as both a tribute to the U.S.A. and to John Philip Sousa, the Washingtonian who made the band great. Just another reason to check out the Marine Band’s full slate of free concerts, presented almost every Sunday at various DMV locations. They can’t all be as spectacular as Monday’s concert, but in my experience every one has something wonderful to offer, and you’ll be hearing a D.C. institution continuing to do its thing after two-plus centuries of excellence. And perhaps a rousing march in among the masterworks, too. The program notes were exceptionally good. The band’s director, Colonel Michael J. Colburn, gave an articulate, engaging encomium to Schwarz before yielding the stage to the guest conductor. Somehow it did not feel rote like most of these classical-music encomia do, possibly because of the use of jokes and specifics. The freeness and military-ness of the concert attracted a different crowd than usual. It was nice to see kids in flip-flops in the splendor of Strathmore, listening attentively. This entry was posted on March 14, 2012 at 7:27 pm and is filed under Concert review. You can subscribe via RSS 2.0 feed to this post's comments.